Where is the world’s largest e-commerce market? Consider this: China already has over three times the online population of the United States. In 2016 alone, China added 43 million internet users – equivalent to the population of Argentina, or nearly double the population of Australia. And while the US has the highest GDP per capita at over US$50,000, China’s GDP per capita of $13,000 is enough to be meaningful and is growing far more rapidly. A mistake that many Western investors make is to assume that the evolution of a developing nation will echo the evolution that has already taken place in more advanced developed nations. But in the same way that younger children avoid the mistakes of their elder siblings, developing nations too often develop in more efficient ways. Film-producer Kodak, for example, used to tout the emergence of developing economies as reasons for optimism over its business prospects. But unlike those in developed economies, consumers in developing countries never bothered with film cameras. They instead went straight to digital cameras, adopting these natively. And the same is true with mobile and e-commerce today. Did you know that the largest e-commerce market in the world is not in the US? It is in China and it is already double the size of US e-commerce and growing at a significantly faster pace. And China’s adoption of mobile e-commerce far outweighs that observed in the US, by a factor of about five times! The Chinese have not evolved like the Americans. They have simply skipped over older technologies and instead adopted the most advanced technologies immediately. Against this backdrop, one should not be surprised to learn that more of tomorrow’s great businesses will be in China; and far fewer in developed regions. McKinsey Global Institute compiled the following forecast in recent years. 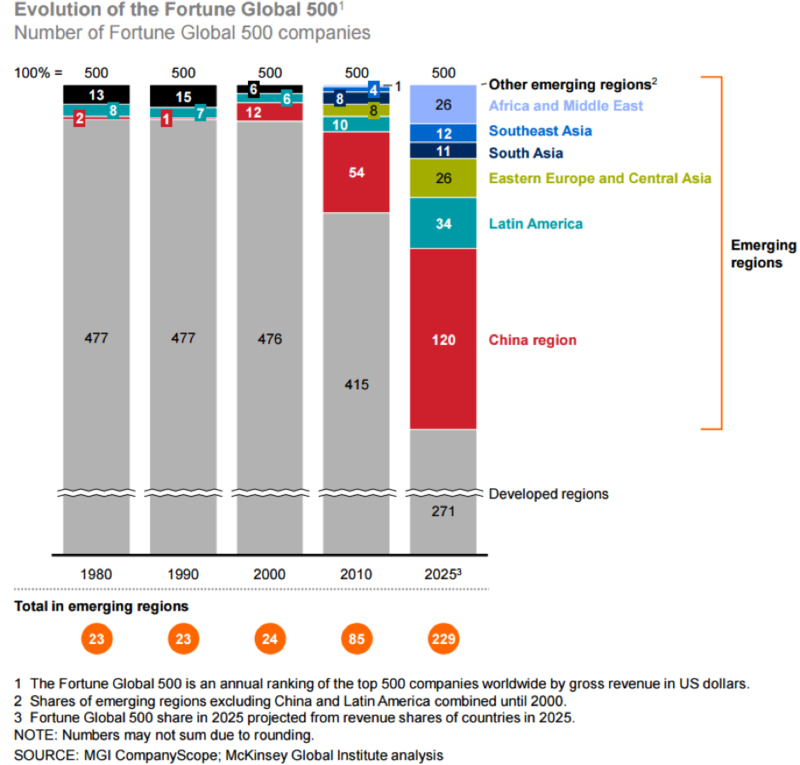 By 2025, emerging regions are expected to be home to almost 230 companies in the Fortune Global 500, up from just 85 in 2010. Given the projected significance of China in the Fortune Global 500, I recently wrote an in-depth paper examining online technology platforms domiciled in China considering the key attributes of these businesses, and highlighting some of the companies we believe could be the businesses of the future. You can access the paper via this link: Who are the businesses of the future?